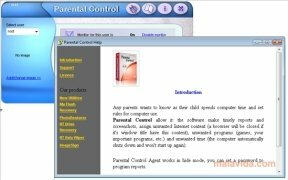 Parental Control is a program that has been developed to be able to control what you children do while they are using the computer, whether by keeping track or by blocking some of the elements. Like many other tools of this same category, it's very easy to use and it has a configuration panel that restricts access by means of a password. The interface is rather simple, because all the program's options are clearly visible and make it easier to be able to configure the whole application, because it is more than probable that not all parents will be looking for the same behavior. - Automatic generation of reports and screen captures to be able to view how the computer has been used. - Assign prohibited URL addresses. - Block applications, to be able to avoid losing data. - Temporary restriction, avoiding the computer being used after a certain amount of time. If you're looking for a tool with which to be able to effectively avoid that your PC is used in an inadequate way, download and start using Parental Control. The trial lasts for a total of 15 days.